I didn’t use MySpace. I was at a point in my life where I felt I was too old for it. (Yes, I just dated myself.) But when Facebook opened up to the public, I was curious and signed up. I was a mom blogger, and this social media “thing” would be a great way for me to share my posts. Talk about content marketer in the making. I enjoy learning about others’ background. There’s a meme that shows up every so often on how it’s never to late to be a success. At age 23, Tina Fey was working at a YMCA. Also at age 23, Oprah was fired from her first reporting job. The list continues on with other notable failures… and then describes how that path led them to where they are today. So I wanted to know, how did our community members get started in social media. Maybe they fell into it. Maybe it was peer pressure. Maybe it was because of a job. Whatever it was, I was curious about their journey and how it’s changed from then to now. 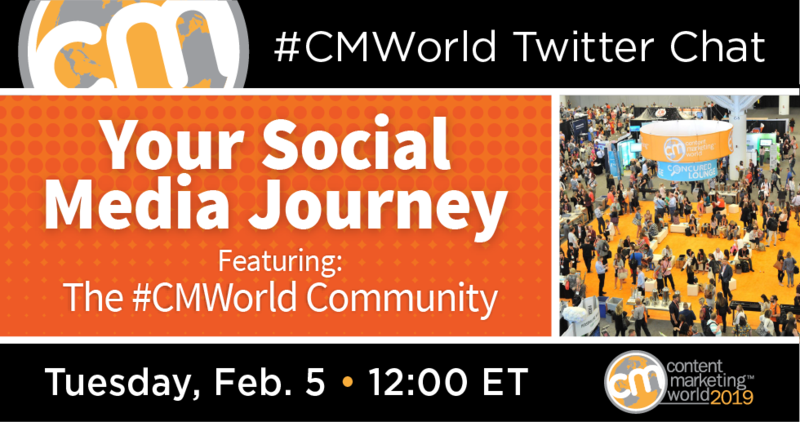 And that bring us today’s #CMWorld Twitter chat. We opened the floor up to our community, and boy, it was a fun discussion. Here’s a quick look at our conversation. If you’d like to see more tweets from the chat, be sure to check out our Twitter Moment. PS, if you would like to take the next step in your social media journey and be a guest on our chat, feel free to DM us. We’re on Twitter every Tuesday at noon Eastern. What attracted you to social media? Which platform did you sign up for first? How much of your personal life do you share on social media? Has that changed over the years? It’s pretty funny to recieve updates from FB from what I was doing 11 yrs ago. Eww…that’s tricky but I do tend to draw a very firm line in the sand between business & personal stuff on social media. I’ve never felt the need to inform people on everything I do (which is why I don’t do IG). I’d much rather save those for actual conversations. Do you remember when you first signed up for a social media account? Tell us about it in the comments below! Want recognition for the work you are doing in social media? The Content Marketing Awardshas several categories honoring the best projects and their use of Twitter, Facebook, and more. You can save on entry fees when you submit before March 8, 2019. So don’t delay and enter today.